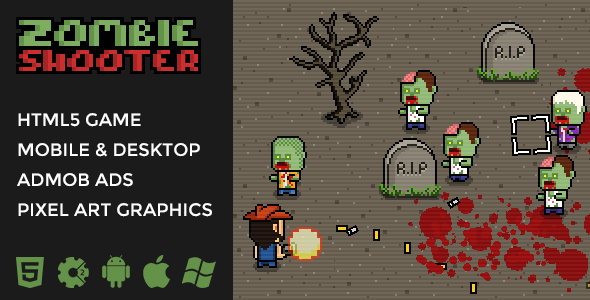 Zombie Shooter is HTML5 isometric shooter game in 8-bit style, built with Construct 2 and optimized for both mobile devices and desktops. Old school pixel art graphics of Zombie Shooter is inspired by 8-bit games from nintendo consoles. Check out live demo above and use W,A,S,D to move and mouse left button to fire. The game rule is simple – shoot the crowds of zombies and survive as long as you can!